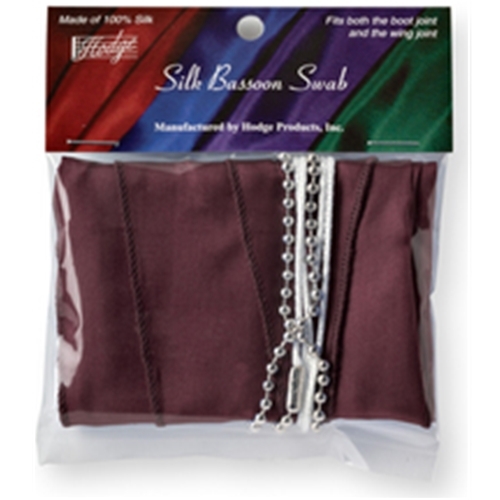 Hodge - Silk Bassoon Swab All Hodge silk swabs are made from 100% silk and come in performers black, royal blue, burgundy, forest green, deep purple, hot pink and silver. Silk is very absorbent, soaking up water in instruments better than any other natural material on the market, including both cotton and chamois. Most uniquely, silk is also very compressible, making it possible to pull through instruments with large variations in bore size. In addition, silk is lint free. Clarinet, Oboe and English Horn swabs are made using a plastic coated straight weight. Bassoon, bassoon bocal, trumpet, and french horn swabs use a ball chain, which is very effective as a weight and more flexible than most traditional straight weights. The ball chain is non-abrasive and does not scratch the bore or other parts of the instrument when used properly. The saxophone swabs and bass clarinet swabs use a plastic-coated lead weight. Hodge swabs for brass instruments are made using a ball chain, which is very effective as a weight and flexible for going around the curves of the french horn lead pipe and the tuning slides of brass instruments. The ball chain is non-abrasive and does not scratch the bore or other parts of the instrument when used properly.